Bloodhound’s back! (His previous comic run was collected this summer as Brass Knuckle Psychology.) It took ten years, but I’m thrilled to see more adventures with (and hopefully more revelations) about the tough-guy supervillain fighter. 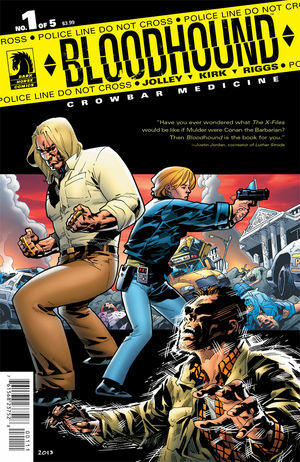 Crowbar Medicine is a five-issue miniseries that opens with Travis Clevenger, the Bloodhound of the title (because he never lets go of things), trying to fit into an unusual environment for him, that of family. Dan Jolley does a terrific job reestablishing bits of his past through natural-sounding dialogue, so this issue is a fine starting point. I also really enjoy Leonard Kirk’s art, which is realistic, but smoothed out, life but better because you know what to visually focus on. Expressive characters carry the dialogue. I particularly love the grumpy woman in the foreground of this panel. Jolley’s writing and Kirk’s drawing a world where there are superhumans, but they’re not a good thing. (Much like our comics industry.) As Clev’s “keeper” (his work release FBI agent supervisor) says, “Even the most minor superhuman abilities can be so dangerous, cause so much destruction, they’re … they’re like grenades. Or assault rifles.” As we see in the parallel story, setting up someone with powers that has to be stopped, because he’s causing uncontrollable damage. What I really like about this series, though, is that it’s smart. Jolley gives his characters complex motivations that go far beyond “good” and “bad”. And that reflects in the cast, too — Clev is a lot more than just a “brick”, a strong tough guy. Most of the time, he outthinks those around him. And he’s willing to take the risk or the pain if necessary, too. This issue, while a satisfactory story on its own, sets up a much more dangerous plot for the miniseries that I won’t spoil, but given the world Jolley has established, promises to be fascinating. It suggests a coming “arms race” caused by a rogue element that’s rather symbolic in today’s world. There’s a preview at the publisher’s website and a variant cover by Cully Hamner.